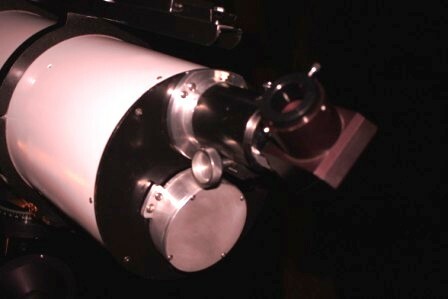 The expense of a folded refractor is modest compared to an APO. I had purchased a surplus Jaegers 6 inch f/15 objective from Surplus Shed which turned out to be superb despite the fact that it was a “second”. There are some light streaks of staining in the lens but it does not affect the performance. Autocollimation show it to be as perfect as I can measure with the test: at least 1/10 wave. The star test confirms that as a lower limit. The most expensive additional component I needed was the larger folding flat. From my previous experience with folded refractors (see Four Inch Folded ) I knew enough to use larger flats than the design may seem to require. I needed a good one, of course. I wanted that was 1/20 wave. You can buy a great 4 inch from Edmund Scientific or Newport Glass Works for about $700. Instead I found a “good deal” and bought a 4 inch flat for $300. I came to regret skimping on this item, though. The mirror was supposed to be rated at 1/20 wave and testing showed that it was very good. However, the outer 1/8 inch or so had ripples in the coating. I thought I could live with that because I had over-sized it for my design, so I did not return the item. Little did I know that the missing 1/8 inch would require a new configuration to avoid vignetting. My original design specification was just a bit too “tight”, even with the additional playing around room. Since the 4 inch folding flat was not good all the way to the edge I had to make some design changes to avoid vignetting. 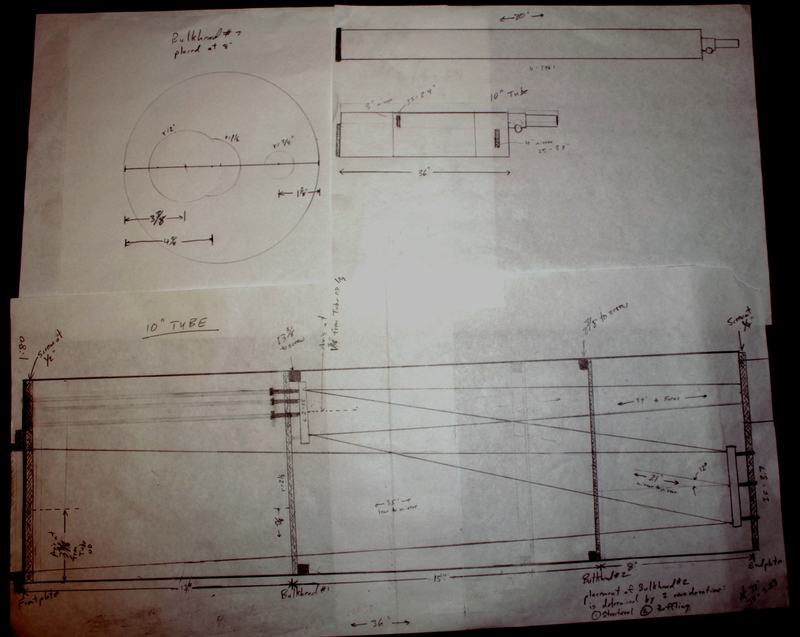 My original design called for the first flat to be mounted on the interior of the tube. When my flat was turned out to be only 3.8 inches, I had to move it back to “catch all the light” from the light cone produced by the objective. This was a blessing in disguise because I got to work with my milling machine for a couple of days to make an exterior cell for the first folding flat. That was fun! This change also made it much easier to collimate because now I could replace that entire flat with a bulls-eye for alignment purposes. For my second folding flat, I happened to already have a good three inch mirror from Newport Glass Works, though I could have bought a new one for $300 or so. This one is rated at 1/10 wave but is probably better than that. The 3 inch flat is oversized by 0.7 inches and it is very nice to have the extra “room to play with” during collimation. It does not add much weight nor cost. I bought the tube and rings from Parallax Instruments . Joe at Parallax makes great components! I decided to forgo making the rings in my shop since I would have had to work too long and hard to approach the quality of Parallax rings. Fabricating the rest of the aluminum components was fairly straightforward for me. This is my original drawing. You may notice that my pencil sketch design has a lot of erasures. The design had to “evolve” a little. The first drawing was just a starting point. This drawing does not incorporate the later design changes that put the first flat behind the endplate and moved the second flat back as well. I made the aluminum lens cell, folding mirror cells and plates using my Southbend 10K lathe and Grizzly G0704 mill with a 6 inch Phase II horizontal table. 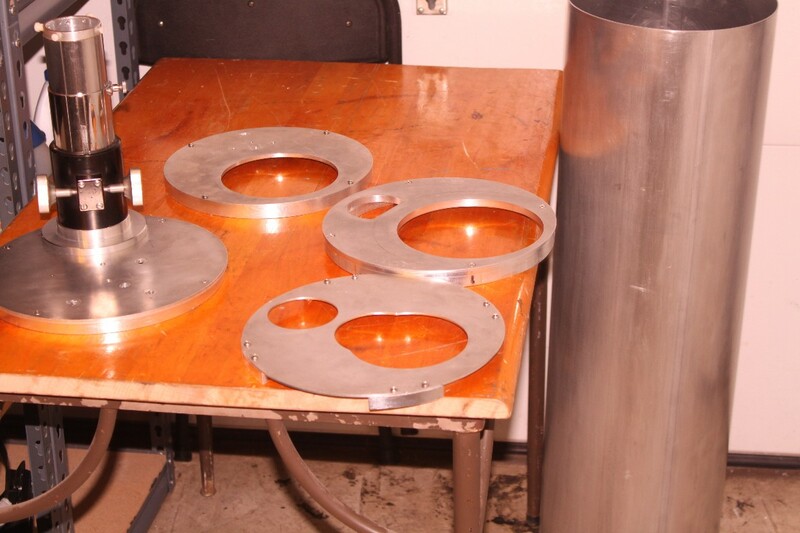 The trickiest part was making the 10 inch end plates and bulkheads. I have a six inch horizontal table so I had to make a jig, but it was not difficult. 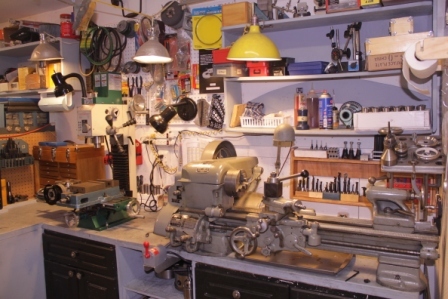 As a matter of fact, for an amateur machinist like me, building this was a lot of fun. I would not have attempted this scope in wood. I thought the scope could end up being quite heavy if built to maintain its adjustments. I built a folded 4 inch more than 20 years ago using only woodworking techniques. It was a little simpler and a lot smaller. The scope was usable but somewhat clunky. Please see Four Inch Folded Refractor for details. I don’t advocate using wood for this particular design of a folded refractor. You really need the strength and rigidity of metal. Making the lens cell. In this picture the interior of the cell is complete including the threads. But this cell has ears for the push/pull adjustment bolts. They are being drilled and excess material will be removed next. The ears are not symmetric. They are biased a little from a 120 degree separation to make them fit the 10 inch end plate. The endplate with the half-moon cutout is the front plate. The smaller cutout is to allow a long adjustment tool to reach through and adjust the second folding mirror. When complete, the hole is covered by a small sheet metal door. The rear plate is solid here. This picture was taken before the first mirror was “moved outside”. A large hole will later be milled in the rear plate and the first folding mirror cell will be attached with three adjustment push/pull bolt pairs. 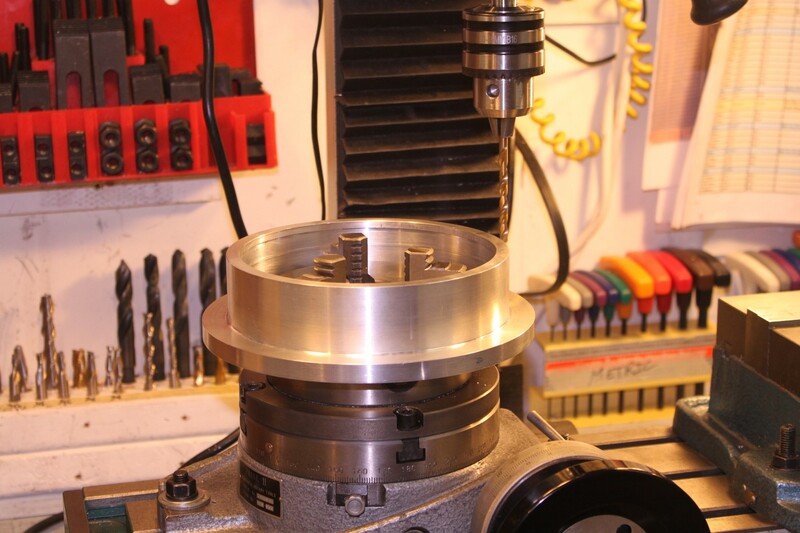 This is the objective lens cell after final milling to remove excess material. The lens is in place. This is the first folding mirror in it’s final external configuration. This cell is a lot like the objective cell but it is closed and it has a built-in tilt of about 6 degrees. This is the second folding mirror mounted on it’s bulkhead. You can see the adjustment nuts underneath, in the shadow. It is a standard push pull arrangement, much like many Newtonian mirrors. On the carpet above that you can see the first folding mirror in its cell. To the left of that is the rear plate with the large hole to allow the external mounting of the first folding mirror. 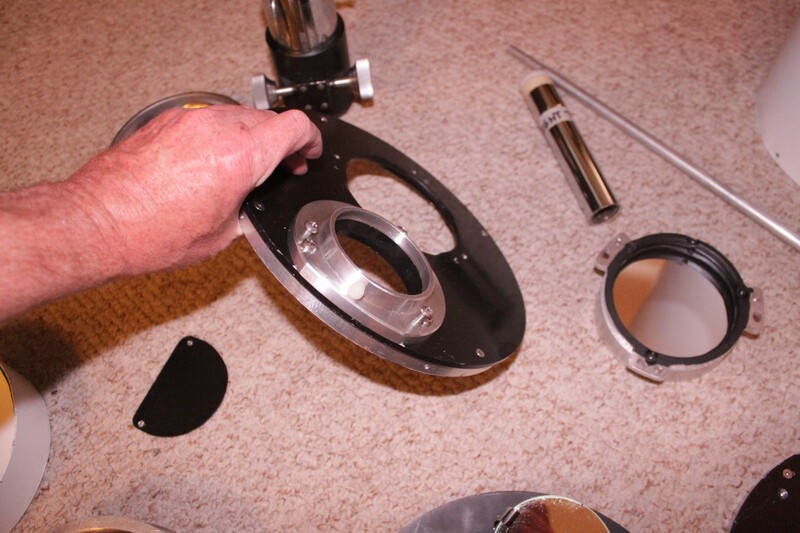 The focuser is a giant Unitron. It is a beauty! This is the rear plate. Notice that the tilt of the giant Unitron focuser is adjustable. 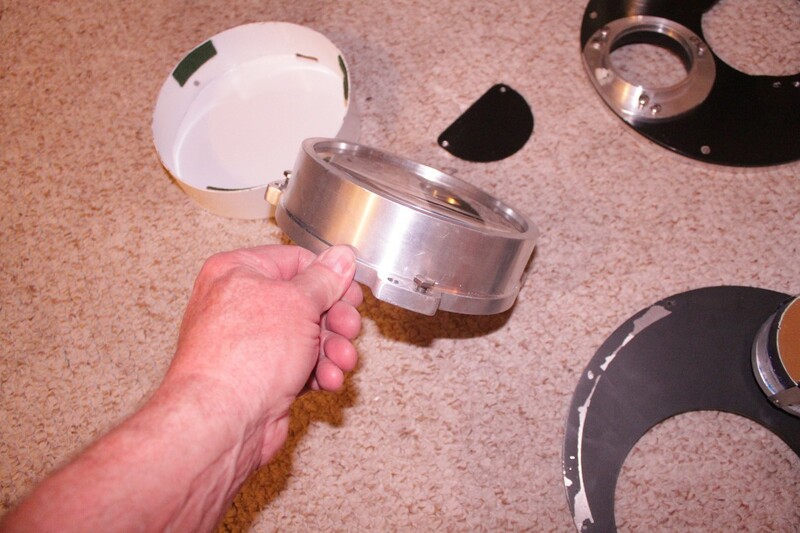 Also notice that I trimmed the focuser mounting plate to fit the 10 inch diameter plate. 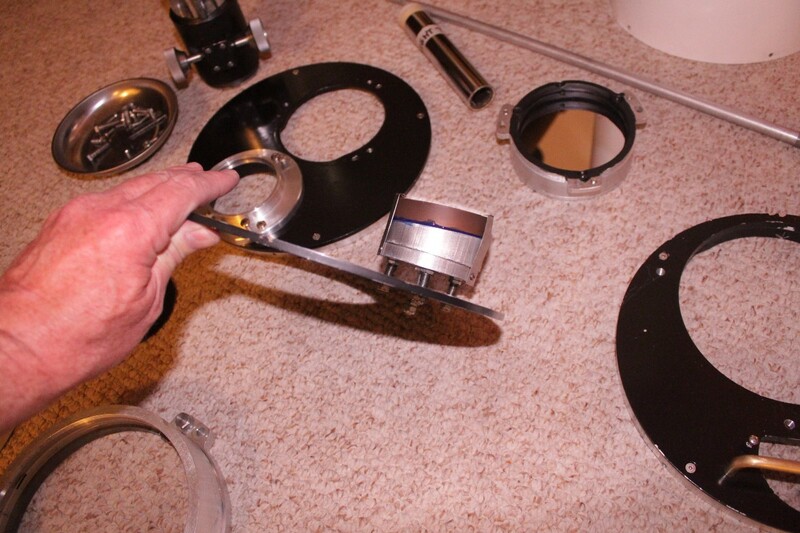 Like the Unitron 131C the focuser can be rotated as well. There is a nylon set screw to hold it in place. 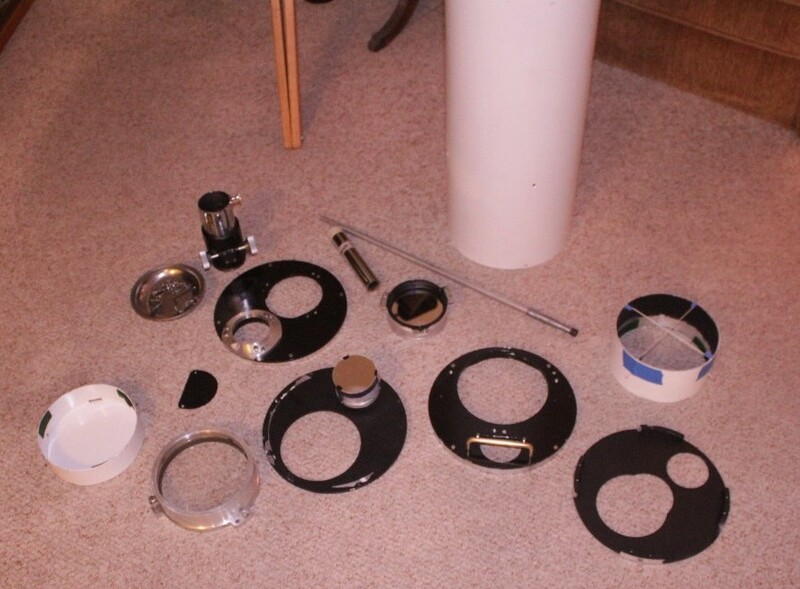 Here you can see all of the components and adjustment tools laid out on the carpet. You can see the asymmetry of the objective cell and the first folding mirror cell bolt positions. When I first started on this scope I had a bad mirror and I saw a lot of astigmatism in the image. I had tested the objective lens in a standard full-length tube and the image was perfect. I also knew it was good from the autocollimation test. So I knew it had to be a bad mirror. I had tested the mirrors by using a small telescope to view a reflected image in each one. Both of the folding mirrors looked good under that simple test. But the test must not have been adequate. Maybe I was a bit too casual. For whatever reason, my larger folding flat was not up to par but I did not see it with the simple test. I suspected that one because the second folding mirror was from Newport Glass works so I was pretty sure it was good. What followed was a lot of trial and error and tearing the scope down and rebuilding it a few times to finally conclude that the first folding mirror was not good. I had two potential candidates in my stock of unknowns. I tried them both in the scope and they were both bad. Interestingly, out of sheer desperation, I placed an old Coulter secondary mirror in the scope and it worked pretty well. The thing must have been at least 1/4 wave, maybe better. All of this was time consuming but the upside was that I became an expert at making all the adjustments and collimating my folded refractor. I don’t ever want to go through that process again, though. Next time I will buy guaranteed top quality folding mirrors from the get-go.The money will be well-spent. My mirrors are specified as 1/20 wave and 1/10 wave for the first and second respectively. I have tested this scope repeatedly as carefully as possible. The star test is perfect, at least as well as I can tell in the notoriously bad Colorado seeing. On several nights of decent seeing, in side by side comparison tests with another 6 inch f/15 objective of identical quality, the scope performs just as well. Through all the testing I did discover that thermal effects are important. For awhile I was seeing some strange behavior in the images that did not appear in the full length scope. The effect was subtle and it came and went. That should have been a clue. After some time, I figured out what was wrong with the folded refractor – tube currents. In my revised design the first folding mirror mount allowed a little air to seep into the tube around the edges. The gap was only about 1/8 inch at the maximum but it was there. So I cut a thin band (1/4 inch) of cheap, flexible insulation foam and stuck it to the mirror mount around the periphery so that it was squeezed when the mirror was in place. The cheap stuff is nearly infinitely compressible so it had no affect on my ability to adjust the mirror. I did the same with the objective and focuser. I sealed up all the little openings everywhere and presto, a much better scope! It shows how important the sealed tube is to a refractor. It’s a substantial advantage.